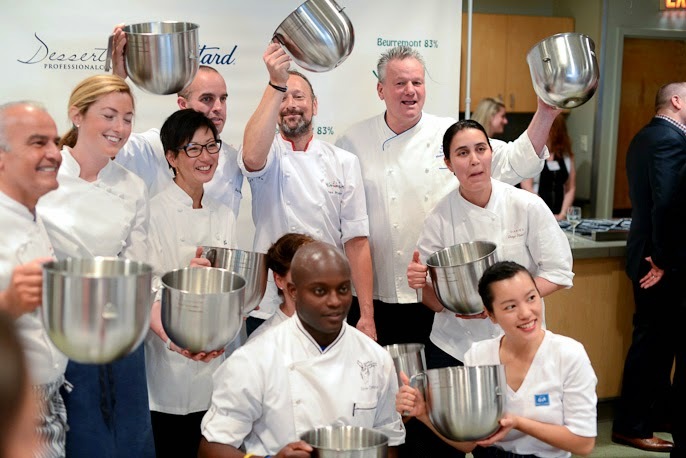 On Monday, I attended the 2014 Top Ten Pastry Chefs in America awards selected by Dessert Professional Magazine presented by Guittard Chocolate, KitchenAid, Beurremont, Nielsen-Massey, and hosted by Institute of Culinary Education ("ICE"). Each year Dessert Professional Magazine crowns the top 10 pastry chefs in the country. I look forward to this event each year as the most accomplished pastry chefs are being recognized and honored. It is a great recognition to their achievement. Though the most exciting part for me and probably for all the guests is we get to enjoy an array of amazingly creative and delicious plated desserts throughout the evening. I was fortunate to be able to sample these tasty morsels prepared by the best in the country. Check out the impressive list of this year's top ten below. These talented chefs are masters of their trade. As a savory cook, I'm in awe of these extremely creative and skilled pastry chefs. I also attached photos from the event so you could feast your eyes on their unique pastry creations. (c) 2011 Savory Sweet Living. All rights reserved. Simple theme. Powered by Blogger.